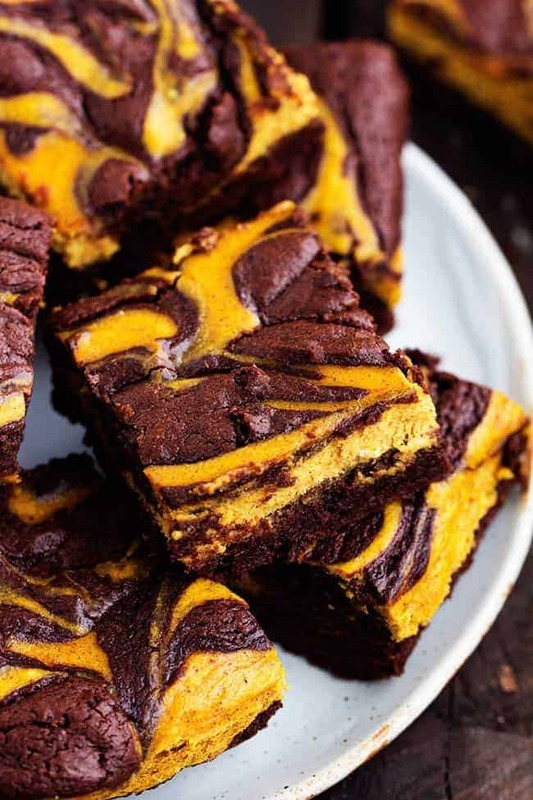 Perfectly moist and fudgy brownies swirled with pumpkin cheesecake. These are so rich and delicious and they make an amazing fall treat! Remember that one time that I told you I didn’t like chocolate? The brownie base is absolutely amazing. Rich, fudgy and moist. And since I can’t get enough of pumpkin this time of the year I wanted to have pumpkin cheesecake swirled throughout. The result was absolutely incredible! I promise that your family is going to love these brownies! They combine two of my favorite things in one and are incredibly moist and delicious with the first bite. 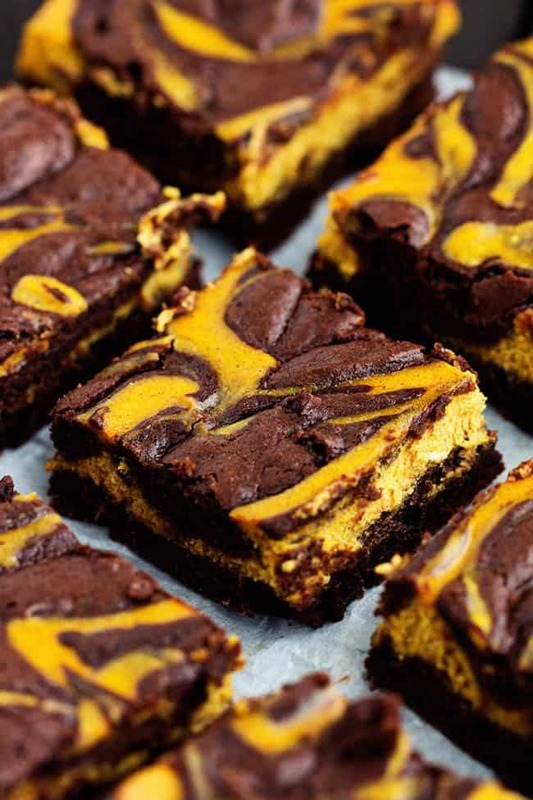 Put these on your list of treats to bake this fall. You won’t regret it! To make the Pumpkin Cheesecake Layer: Beat together cream cheese , pumpkin, egg, sugar, cinnamon and nutmeg until smooth and creamy. Set aside. To make the brownies: Preheat oven to 325 degrees. Line an 8x8 inch pan with foil and spray with cooking spray. In a large mixing bowl combine flour, baking powder and cinnamon. In a microwave safe bowl combine butter and chocolate. At 50% power microwave 30 seconds at a time stirring until it is smooth and melted. In a medium mixing bowl, whisk sugar, eggs, and vanilla. Add melted chocolate and continue to stir until incorporated. Add the flour mixture and fold until combined. Pour half of the batter into the 8x8 inch pan. 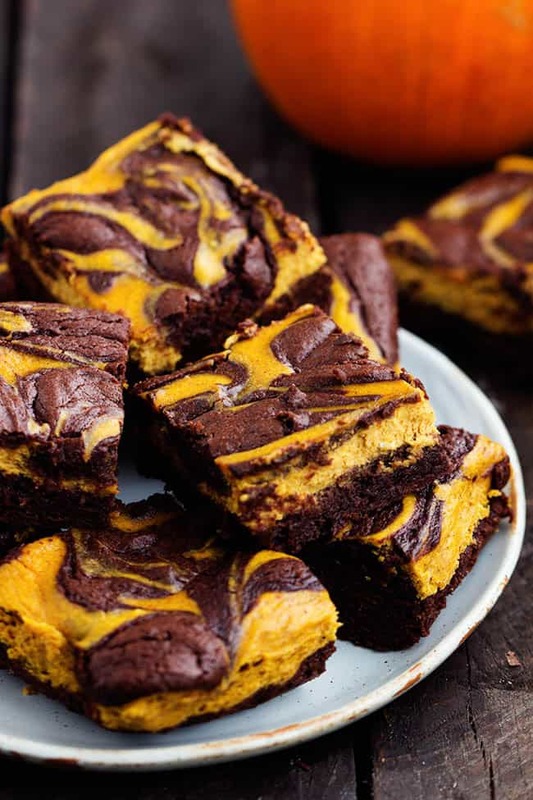 Spread the pumpkin cream cheese evenly on top of the brownie batter. Drop remaining batter by spoonfuls on top of the cheesecake layer. Marble with a knife. Bake for 35-40 minutes or until a toothpick inserted in the center comes out clean. Cool for an hour before cutting. No chocolate? Crazy girl! These look like the perfect fall treat! No chocolate??? What did you eat instead? These look amazing, and the colors couldn’t be more perfect for Halloween! These are amazing! I just made them and forget about waiting an hour to cut them, they were devoured the moment they left the oven! Thanks for such a winning recipe!